Raw Wraps (again). | Eat More Plants. 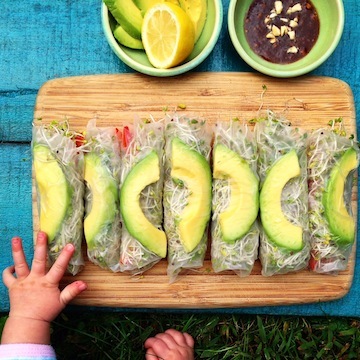 I made these delicious and quick wraps for lunch today. 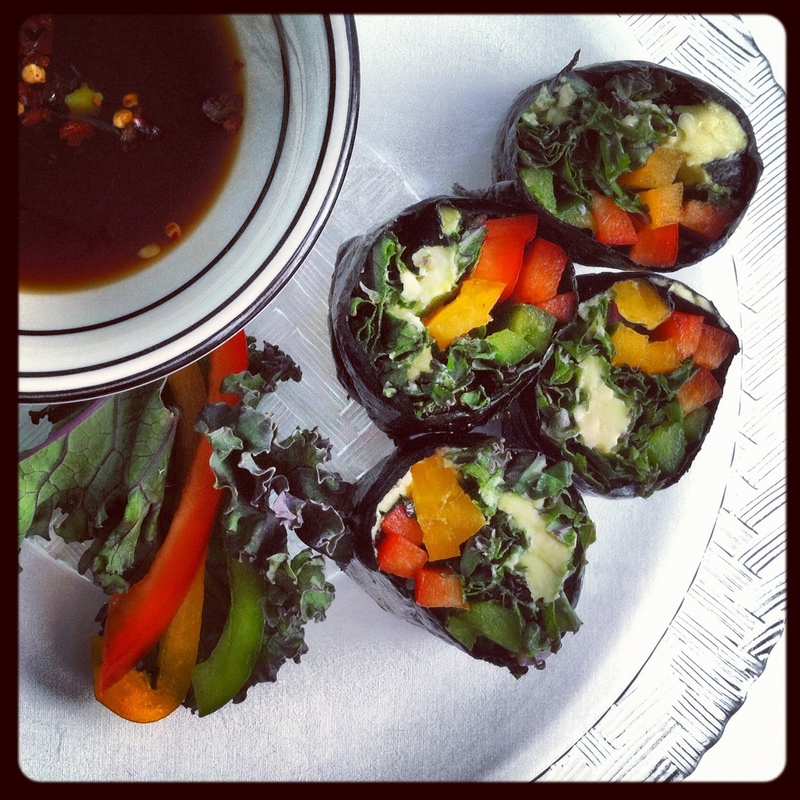 You can use any green, leafy veg as a wrap if you don’t have nori. Collard greens, swiss chard, spinach and kale all work wonderfully. I laid a piece of nori down on my sushi mat, shiny side down. Sliced some different colored bell peppers very thinly, scooped out an avocado half and sliced it thinly as well and did a nice chiffonade to my kale. Layer each veggie down evenly on the nori, starting about an inch away from the side closest to you. Always leave the farthest third of the nori empty so you have enough room to roll. Pick up your sushi mat and gently roll everything over and squeeze tightly. If you don’t have a sushi mat you can do this with a clean kitchen towel or even free hand. I usually have a dish of warm water nearby to wet the end of the nori to seal it shut. Just wet your fingers and run across the inside end and press gently down to seal it. I find that using a very sharp knife helps to cut your roll cleanly, without tearing it. Dipping it in warm water in between cuts also helps. I made a quick dipping sauce of tamari, lemon juice and red pepper flakes. Google how to roll sushi if you need more detailed instructions. There’s a great wiki tutorial that shows step by step. I used it the first time I did it, don’t be afraid to ask for help! Raw Vegan Carrot Cake. Cashew “Cream Cheese” Frosting Included…! Sorry that you’re having problems on here. I don’t think it’s WordPress though, it may be your browser. WordPress is quite adaptable for smart phones and regular computer screens, I’ve never had a problem!